Altitude sickness is one of those things that never really occurs to a traveler until it happens. We tend to associate it with climbers, but really, it can hit if you visit any place with high elevation, such as Utah. Even if you’re not prone to it, it could strike at the most inopportune moment, even when on a flight, where changes in air pressure could make one experience a modest case. Here are some things you can do to stave off altitude sickness or manage the symptoms should it strike. If you find yourself experiencing mild altitude sickness (symptoms include gas, fatigue, shortness of breath), something as simple as a little ibuprofen can do the trick. You can stock up on Advil at any airport store or Pharmacy, and it’s never a bad idea to carry a little Advil on a flight. If you’re prone to getting altitude sickness on a plane, or in an elevated location, make sure to stay hydrated. Always carry around a bottle of water, as dehydration can exacerbate your symptoms. While staying hydrated is important, drinks such as caffeine and alcohol actually add to dehydration, and won’t help you manage your symptoms. If you’re experiencing gas or bloating due to altitude sickness, a strong cup of coffee can make things a lot worse. The same thing goes before an attack comes on. If you’re prone to altitude sickness, avoid these drinks the day you travel and stick to water. 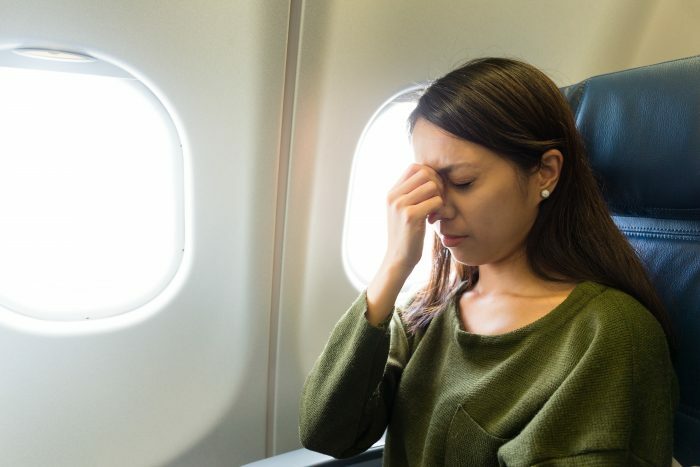 While it’s generally advised to avoid exercise if you’re experiencing a case of altitude sickness when stuck on a plane for several hours, doctors suggest getting out of your seat and walking up and down the aisle a bit just to get the blood flowing. Here’s the good thing about altitude sickness – it’s usually temporary. If you’re experiencing it on a plane, once you land you should feel fine. If you’re staying in an elevated location and can’t descend lower, after a few days of relaxation your body will get used to it and you’ll most likely be fine. Most attacks are mild, although if you experience major symptoms such as extreme lethargy, confusion, and trouble walking, see a doctor. If you suffer from a chronic illness or are pregnant and traveling to a high elevation, make sure to consult your physician before your flight.